Let’s first look at “liability”, as its one aspect or element of a personal injury tort that many of us are familiar with. To prevail in a personal injury case, the victim, often called the claimant (before suit is filed) or plaintiff (after suit is filed), must prove some other person is at fault. If the claimant proves the other person is 100% at fault, then the victim is entitled to recover 100% of his or her monetary damages. Injuries & Damages In A Personal Injury Case—How Badly Was The Victim Hurt? 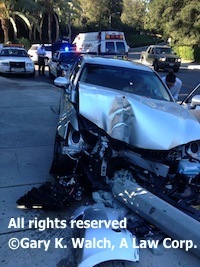 However, if the victim was partially at fault, for example in a car accident case, if the primary responsible party ran a red traffic light but the victim in another car was found to be speeding and 20% at fault, then the victim would have 20% of his or her damages subtracted or taken away and be entitled to only 80% of his or her total damages. That is called comparative liability or comparative fault. Before this comparative liability doctrine came into effect in California, the old rule was if the victim did anything wrong, even if just deemed 1% wrong, that contributory liability or negligence would be deemed a complete bar to any recovery and the victim would NOT be entitled to any damages at all. That contributory negligence doctrine fortunately was ultimately considered too harsh and abolished years ago in California in favor of comparative liability. There is NO hard and fast rule or formula in determining liability. Often common sense guides the determination. For example, if a car is stopped for a few seconds and rear ended by a truck whose driver may have been texting or otherwise distracted, then the truck driver is generally deemed to be 100% at fault. However, if under the above example, the car driver made a sudden stop for no good reason, for example suddenly realizing missing his or her turn, then the car driver might be held partially responsible. Another example that frequently occurs in a traffic accident occurs when a left turning driver starts to turn left just after a traffic light turns red while a car travelling straight in the opposite direction enters the intersection on either a yellow or red light, possibly traveling too fast for conditions or in excess of the posted speed limit. While the left turning vehicle must wait for the intersection to clear before completing his or her left-turn and may be found to be 100% at fault for causing the collision, if it is found that the car travelling straight entered against a red traffic light and/or was “speeding” (i.e, travelling too fast for conditions and/or in excess of the posted speed limit), then the car travelling straight may be found to be partially or completely at fault. Still another example occurs in what is called a premises liability accident case when someone trips or slips and falls on someone else’s property and is injured. If a retail store, such as a super market, just mopped an area and while it is still wet and slippery failed to post any warning signs or cones to warn the general public of this unsafe or dangerous condition, the store owner may be held 100% responsible for causing this incident and all resulting damages. However, if the floor was obviously wet and should have been noticed by a customer, then the customer might be held partially responsible or comparatively negligent. In a similar premises liability example, where a store employee leaves the mop lying on the floor and the customer trips on it and falls, the store owner might be held fully responsible for negligently leaving the mop where a customer might trip on it or since the mop could have been seen if the customer was carefully watching where he or she was walking then the customer might be held partially responsible or comparatively at fault. A good personal injury lawyer in this last example would argue the customer of the store was simply looking at all the displays and signs the store spends thousands of dollars creating to get the customer’s attention and did nothing comparatively at fault or negligent by not looking at the floor while being intentionally distracted by all of the store’s colorful distracting displays. If you had a personal injury, our personal injury & wrongful death accident lawyers offer an absolutely FREE & CONFIDENTIAL case consultation and evaluation and we work on a contingency fee. That means there is NO fee until you WIN and then the fee comes out of the recovery usually paid by the other parties’ insurance company and not out of your own pocket. Simply click here for our quick and easy contact form to tell us about your personal injury or other injury accident.